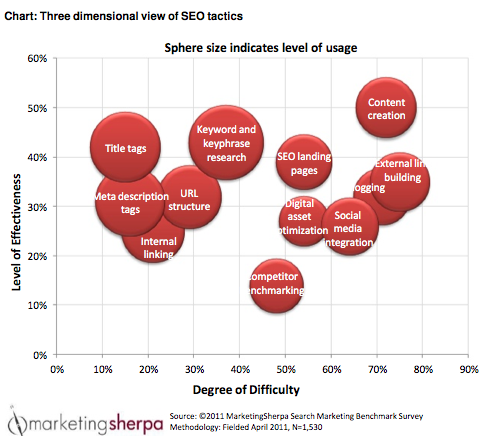 MarketingSherpa just released its eighth annual 2012 Search Marketing Benchmark Report – SEO Edition. The 202-page report, which is organized by company size, primary market, industry sector, social media use and SEO maturity, examines the SEO habits and effectiveness of some 1,530 B2B and B2C marketers. But looking beyond individual SEO tactics to the companies’ big-picture B2B marketing strategies reveals some interesting insights about how today’s businesses are – or aren’t – leveraging their SEO techniques. That last point is particularly interesting, as it reveals a disconnect between what companies want from SEO and what they’re inclined to actually do. Many organizations are sidestepping the discipline of charting out a strategic plan, choosing instead to put their immediate focus on tactical objectives like increasing website traffic, lead generation and measurable ROI. […] They need to be strategic with their planning and processes, and ever-savvy with the creation and optimization of all digital assets. But developing a process to plan, measure and execute their SEO programs’ performance isn’t their top objective. In fact, increasing measurable ROI ranked higher as an objective than developing an actual strategy to do so! So despite encouraging findings about companies that strategically implement formal processes for SEO optimization – for example, that they yield 150% more lead conversion than companies with no such processes in place – only 27% of companies surveyed said they considered planning an effective SEO strategy an important objective. This is a logic gap that companies will need to repair if they want to realize the top revenue results they crave in the long term. It’s true that SEO and other inbound marketing techniques aren’t always easy. Content creation, in particular, was cited as the most difficult process – but also the one that yielded the greatest returns. See the graphic below for how the various techniques stack up. Where to begin planning your SEO strategy? The white paper 3 Steps to B2B Marketing Optimization by Lee Odden of TopRank Marketing, Anna Talerico of Ion Interactive, and Maria Pergolino from Marketo is a great place to start.